You are at:Home»Events»Contest»Take part in the London 2013 K-Pop Cover Dance Festival! Win a Trip to South Korea! Take part in the London 2013 K-Pop Cover Dance Festival! Win a Trip to South Korea! Are you a K-Pop fan that knows all the choreography to every one of your favourite songs? Do want the chance to win an all expenses paid trip to South Korea and the opportunity to perform on stage? 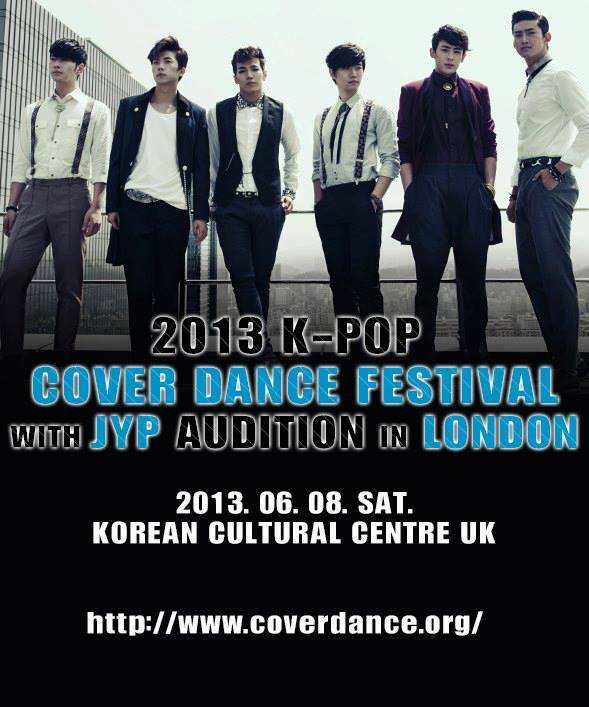 The Korean Cultural Centre UK (KCCUK) will be holding the 3rd K-Pop Cover Dance Festival (with JYP Audition) at the KCCUK HQ in London on the 8th June 2013! As in past years, the participants that pass all rounds of the competition will get a free, all expenses paid trip to South Korea. This trip includes a tour around Korea and the chance to perform on a real stage! – Upload your cover dance videos. – Be sure to go to the same website above and scroll down to the ‘NOTICE’ section for more details. Please read everything through carefully before you sign up. Be quick to get your place and not miss out on this great opportunity! [All image and info credit goes to the KCCUK and associates for the 2013 K-Pop Cover Dance Festival London (KCCUK Official Facebook), www.coverdance.org]. Next Article [EDITORIAL]: Marital Issues – ‘Shotgun’ Weddings in the K-Entertainment Industry?